Going to Augusta to watch The Masters is the dream of all golf enthusiasts, and I am thrilled to say I have been a ‘patron’. However good you may have thought the trip would be, multiply it countless times because the experience is not easy to put into words. 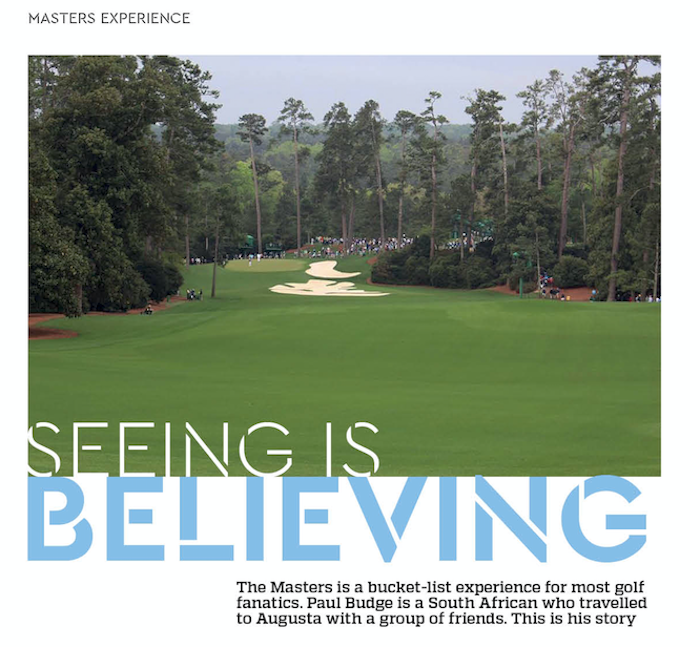 Augusta is a distinctly inauspicious town, but going through the gates to the course, for a golfer, feels like walking into paradise. The entire atmosphere is one of respect for the etiquette of the game. The list of prohibited items is long, including no cameras or phones. Indeed, what can be taken in is limited, but this is mitigated by visiting the substantial shop which contains just about everything that can have a Masters logo attached to it. We read beforehand that the average spend is $700 per day per patron in the shop. While we did not quite reach that level, we left laden with memorabilia and gifts to show off back home and to honour requests from the many who wished they could be there. The essential purchase is a Masters deck chair (you may not bring in your own). It’s remarkable that you can place your chair anywhere on the course, leave it for an extended time and when you come back to it, it will be untouched and unmoved. We were told we could leave our belongings on our chairs, but we weren’t that brave. Aside from the course and the golf, the patron’s experience is wonderful. There are plenty of customer service people, assuring a good-humoured fast track through the food concessions (also all Masters branded) and, importantly, through the washroom facilities. They do everything to maximise your experience and get you back on the course, while constantly encouraging you to ‘have a good day’. The course is absolutely pristine. Everything is immaculate and every blade of grass is manicured to perfection. Having watched the tournament on TV for so many years, we felt prepared for what we might see, but we didn’t expect the slopes and undulations. It really is quite a hilly course. We went to Augusta in 2017 and had the pleasure of seeing Sergio Garcia win in a playoff with Justin Rose. It was wonderful to watch them, with us living in a European base, and of course with Justin originally coming from South Africa. We attended Friday’s play and went again on Sunday. Our chairs were positioned on the slope above the par-three 16th green, from where we could also see the green of the 15th and the tiered green of the steep par-three 6th. We positioned our chairs at 8:30am and came back to them at noon, where they were sitting untouched. We spent that Friday soaking it up and getting our bearings. Sunday was the real deal. I love watching all sport and it reaches another dimension when you see the best in the world playing the course they dream of the most, for the Major they want to win the most. Ernie Els was first off, on his own with a member of the Augusta club, and what a pleasure it was to be so close to that beautiful slow and smooth swing. We followed Ernie for a while and then slowed to see the field start to come through, which included Charl Schwartzel, Louis Oosthuizen and Branden Grace. From lunchtime it really hotted up. Matt Kuchar got a hole-in-one on the 16th and Sergio almost eagled the 15th, which we could see coming at us. Being so close, you are in awe of how these pros can shut themselves off and how they apply themselves at critical moments. The cat and mouse between Sergio and Justin was amazing drama – we went back to the 13th to watch it and saw them come all the way through. While it looks hectic on TV, we found it easy to get close to the action, comfortably walking alongside players and finding seats in the stands at many vantage points. Despite it being two years ago, we still remember it all so clearly. We played on local courses during the intervening days, and on the following Monday I could not believe how I had slowed down my own swing and how inspired I felt. I know how privileged we are to have been able to be there – if the opportunity ever comes up for you to do the same, go! Be sure that if you manage to tick the year’s first Major off your bucket list, to not fall foul of the rules. When Billy Payne, Augusta National’s chairman from 2006 to 2017, was questioned during his final Masters about the ban on cellphones at the tournament, he replied, ‘You’ll have to ask the next chairman. That’s not going to change while I’m chairman.’ Pressed on why the club continued to ban a device that has become so indispensable in people’s lives, Payne said: ‘I just don’t think it’s appropriate. The noise — the dialling, the conversation – isn’t just an irritation to the players. It’s a distraction and that’s the way we’ve chosen to deal with it.’ New chairman Fred Ridley hasn’t changed the policy. Strictly in place remains the instruction: ‘The use of such devices for phone calls, emails, text messaging and other photo, video, or data recording and/or transmission is prohibited. Devices such as fitness tracking bands and electronic watches are permitted.’ There are a couple of spots where cellphones are allowed. Players can use them in the locker room. They’re also permitted in the media centre, though a constantly streaming message on the video board warns reporters not to even think of taking their devices out of the building. It may strike some as a touch ironic that two of the three pillar corporate partners at The Masters are IBM and AT&T, blue-chip leaders in the IT and telecom sectors. However, patrons aren’t totally cut off from the world. At the main entrance, not far from the 1st fairway, there’s a row of 24 phones – actual landlines, if anyone remembers what those were – enabling fans to place free calls anywhere in the United States (international calls require a credit card). There’s a huge fence around the course to keep out animals. There has been one deer sighting in the past 65 years, and visitors often talk of never seeing a single squirrel (New York Times). There are no birds, squirrels or insects at The Masters. The Washington Post sent two staffers to sight one bird in a two-day visit. They didn’t see one. Those bird calls you sometimes hear on the Masters broadcast? The source remains undiscovered, the paper reported. The lakes are also reportedly artificially enhanced to look immaculate on TV. Golf Digest tested the water on one hole in 1996 and found food dye. TV commentators are not allowed to refer to fans as ‘fans’ or ‘spectators’. They are to be called ‘patrons’. The rough is also to be referred to as the ‘second cut’ (the Age). The Masters banned CBS broadcaster Gary McCord in 1995 for saying, ‘They don’t cut the greens here at Augusta, they use bikini wax.’ There is a house located in the middle of the Augusta National parking lot because the owners refuse to sell it. The family has reportedly turned down ‘millions’ (Business Insider, US). Cash – or your bank card. However, ensure your wallet or purse doesn’t exceed regulations and mustn’t be larger than 10’x10’x12′ (in its natural state, the instruction hastily adds).